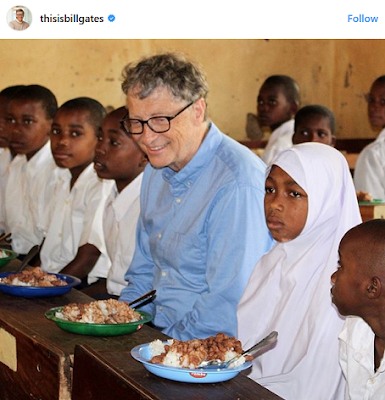 Bill Gates joins Instagram – Royal Times of Nigeria. Billionaire Bill Gates has joined instagram!. His first post came from Tanzania, where he had lunch with students at the Kicheba Primary School in Muheza. The billionaire said in his first message, “Melinda and I have been coming to Tanzania for many years now,”. “I always love seeing how much progress the country has made to improve health and provide opportunity. Plus, the scenery is stunning. Whenever I travel to places like this, I wish others could come along and meet the people I get to meet. I have no doubt it would leave them as optimistic as I am about progress happening around the world. I’ll be sharing photos from my adventures here on Instagram, and I hope you’ll follow along,”.